Hi, I'm a 21 yr old active, athletic college student - that was until my injury. I was tackled in an intramural flag football game the beginning of September. I just remember the excruciating pain that I was in. I couldn't move my left leg, it had hurt too much so one of my friends immediately applied ice and 911 was called. After being taken to the ER I got an xray taken and a brief gait analysis. I didn't want to believe that I had done anything major, I just wanted to believe that I would wake up the next morning and be good as new. I was told I had a segond fracture (usually related to ACL tears) and an appt with an orthopedic surgeon was set up the next day. Upon leaving the ER I was new to crutches so I ended up falling and felt the same excruciating pain once again. I let out screams and tears - it was awful. and my family support through phone calls and emails. When I went to see the orthopedic surgeon he was almost certain that I tore my ACL and scheduled me for an MRI in October (just days before my planned surgery on Oct 13). My doctor had a cancellation in his surgery schedule so instead of getting it done in the winter, I was able to move it up. This way I will have the summer to enjoy. After discussing different surgery methods, my doctor seemed very intent on the hamstring allograft surgery. Since I'm a small figure, my doctor believed that allograft would be the best method. 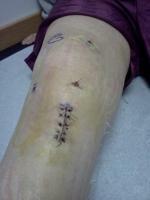 My knee has been improving since I last saw my doctor. He was very intent that I wean off the crutches and wrap that I was using for the first week so that I could promote healing and reduce the swelling. Certainly I felt insecure without my bandage on but I became used to it. I was certainly very careful and within in a week the swelling and bruising reduced significantly. I have almost full ROM and things seem almost back to normal, except I know it's not. I still ice a couple times a day and do light exercising every other day especially focusing on gaining more ROM. I've recently been researching more on ACL injuries and surgeries since mine is coming up in 2 weeks and I am so glad to come across this site. After reading a couple stories myself I felt as though I should wait until Winter break to do the surgery so that I would have more time to recover but I hope that I will have a speedy recovery and I hope to manage the surgery and pain well and handle school at the same time. I hope to keep this updated pre/post surgery and I hope that those who read it find it helpful! Best wishes to those going through this experience, stay strong!